Stuck on what to get mom for Mother’s Day? Here are 10 high tech gift ideas. Mother’s Day 2018 falls on Sunday, May 13. That means time is running out if you’re going to pick up something to show mom just how much you appreciate her and everything she does. While flowers, chocolates and maybe a spa certificate are traditional, some of the best gifts to choose from these days are high tech gifts. The kind of stuff that she might not pick up for herself, but would love to try out. Of course, picking from the millions of products out there isn’t exactly easy. To help you out, we’ve put together a gift guide showing 10 of the hottest high tech gifts for Mother’s Day 2018. Smart speakers continue to be among the most popular high tech gifts. When it comes to smart speakers, no-one has come close to catching market leader Amazon.com, Inc. (NASDA:AMZN) and Alexa yet. With the Amazon Echo Dot, mom gets Alexa voice control in what is easily the most stylish member of the most popular smart speaker family. 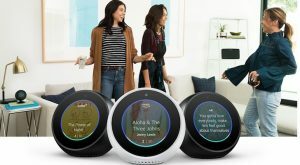 Even better, because the Echo Spot has a built-in display and camera, she can use it to watch video, display the weather forecast, and enjoy free video or voice chats with family and friends who have an Echo or the Alexa app. Is mom interested in a fitness tracker, health monitor or maybe even a smartwatch? 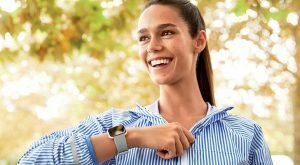 The Versa is Fitbit Inc’s (NYSE:FIT) first true smartwatch. It’s also sleeker than last year’s Fitbit Ionic, has an integrated heart-rate monitor, local music storage, runs apps and supports sleep tracking. Compared to Apple Inc.’s (NASDAQ:AAPL) Apple Watch Series 3, it has superior battery life (4+ days to one day) and also costs less. A connected security camera is a great idea for someone who wants to keep an eye on the house, package deliveries, and to receive alerts for potential intruders. These are among the best gifts for someone who works or travels. 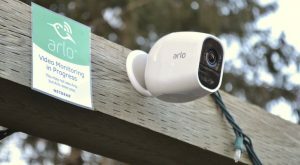 There are plenty of options to choose from these days, including options for Amazon and Nest, but if mom isn’t already invested in one of those platforms, the Arlo Pro 2 HD makes a great choice. This security camera system (it’s sold in a two-pack with a base station) is wireless, offers 1080p video with night vision, runs on built-in rechargeable batteries that last a month, and it attaches anywhere with a magnetic mount. The Arlo Pro 2 is easy to set up, easy to use, and works well. Is your mom a music fan? Or maybe she likes to watch streaming video on her tablet. Either way, a pair of wireless, noise-cancelling headphones make the experience a lot better. No wires and no background noise –kids arguing, traffic, or dogs barking. A lot of noise cancelling headphones are bulky, though. Many are downright ugly. Not the Q Adapt On-Ear headphones from Libratone. 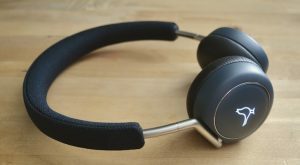 I reviewed these last year and they’re still my favorite noise cancelling headphones. They offer excellent sound, effective (and adjustable) noise cancellation, and a sleek, stylish Scandinavian design that turns heads. Is this the year that mom’s due for a new iPhone? If so, the iPhone X is worth considering –at least if you have the budget for it. 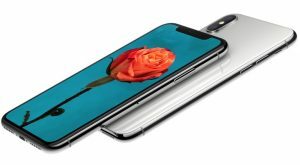 It’s loaded with Apple’s latest tech, including wireless charging, the new TrueDepth camera for Face ID (and Animoji), and a brilliant, bezel-free OLED display. The iPhone X also offers a nice form factor for someone who wants a big display but doesn’t have big hands. Despite having a 5.8-inch display, the iPhone X is narrower and lighter than the 5.5-inch iPhone 8 Plus, making it much less awkward to hold for someone with smaller hands. 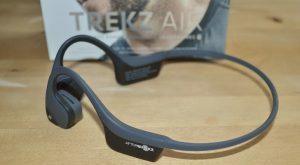 AfterShokz Trekz Air is one of those high tech gifts that have far more advanced technology than people realize, and work remarkably well. Any mother who’s into fitness would likely appreciate a nice set of wireless earbuds for Mothers day. The AfterShokz Trekz Air are actually a better choice in many cases, especially for outdoor activities. They are wireless, but use advanced bone conduction technology that transmits sound through the cheekbone. No buds to drop out, the ear remains unobstructed so background noise can be heard, battery life is longer than true wireless earbuds, and they’re more comfortable than pushing a bud into the ear canal. They sound pretty good, too. If mom loves to use her smartphone for shooting family photos, Moment has a great way to up her photography game. Moment’s system includes high quality optical lenses such as telephone and wide angle options. 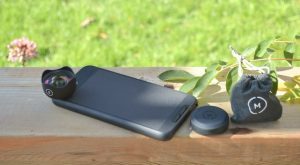 They quickly attach to a Moment case to supplement the smartphone’s built-in camera. I reviewed a Moment Battery Photo case and lenses and found the results to be fantastic. There are options for most recent iPhones, the Galaxy S8, S9 and Note 8, and Pixel phones. 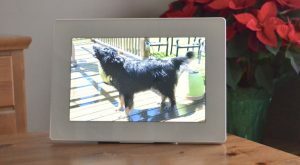 How about a high quality digital photo frame to display all those pictures mom snaps? The PhotoSpring offers a 10-inch HD display that shows off digital photos in style. But this frame offers a lot more. It’s connected via Wi-Fi, and she can give access to friends and family, allowing them to remotely upload their photos (and videos) so she can enjoy them. PhotoSpring also has an integrated battery and touchscreen capability, so it can be taken off its charge stand and used like a tablet to easily swipe through digital photo albums. Buffy claims its comforter is the most comfortable on earth. I can’t verify that, but after trying one for a month I can say it more than lives up to expectations. It doesn’t seem to matter how warm or cold it is in a room, the Buffy comforter keeps you at the perfect temperature. The key is embedded material from 37.5 –high tech active particles made from volcanic sand and coconut shells. The Buffy comforter is also animal cruelty-free, uses eucalyptus fibers instead of cotton (to save water) and includes microfibers made from recycled plastic bottles. Is your mom a gardener? If so, she’ll likely appreciate the Orbit B-hyve Hose Faucet Timer. This clever, Wi-Fi connected device converts an ordinary outdoor tap and hose into a smart watering solution that can be controlled by a smartphone from anywhere in the world. It’s also voice-controllable with Alexa. No more manual watering of lawn and gardens, or worrying about the gardens dying from lack of water during a summer vacation. 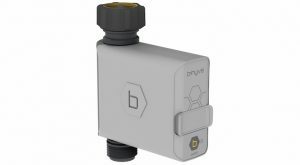 With the Orbit B-hyve Hose Faucet Timer, connect a sprinkler and program a watering schedule. Fire up the sprinkler manually on demand, and it will even automatically hold off on a scheduled watering session when rain is in the forecast. Article printed from InvestorPlace Media, https://investorplace.com/2018/05/10-high-tech-gifts-mom-love-mothers-day/.